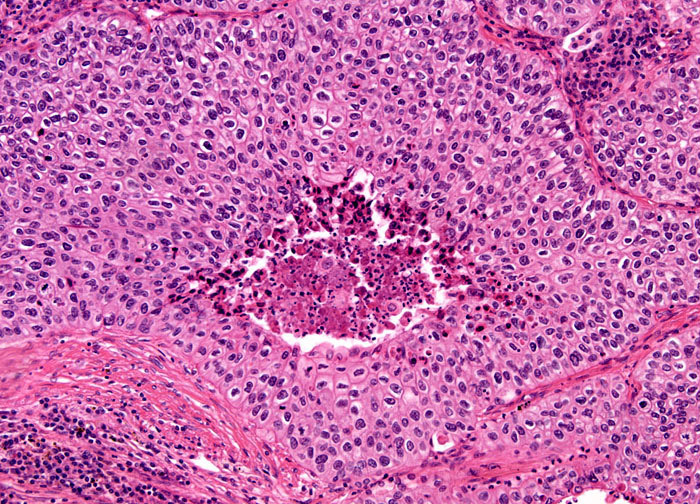 Epidermoid carcinoma, also known as squamous cell carcinoma, is accountable for 25 to 30 percent of all primary lung cancers. One of three main types of cancer known as non-small cell carcinomas, the disease typically originates in the central area of the lung, either in one of the main bronchi or in a major lobe. Epidermoid lung tumors characteristically are comprised of cells that are flat and scale-like. Often they do not metastasize as quickly as other lung cancers, which frequently make them easier to treat if caught early. When metastases do occur, they typically invade the tissues of the liver, brain, small intestines, adrenal glands, and bones.